Well, the streets and interwebs are both a-buzz with Holiday commerce! Between Thanksgiving and Black Friday (here in the States), the opening of the Holiday shopping season, and Cyber Monday today … there’s a lot of money emotions and transactions and plannings going on! So … how are you feeling about all of it? Does it overwhelm or stress you? Are you excited by the energy of it all? Do you feel frantic or frightened about buying Holiday gifts and having enough? For so many of us, the Holidays are a time we “check out” about finances. Yet at the same time, our patterns around money are magnified a thousand times this time of year, thanks to the intense emotions, family dynamics, and emotional challenges of the season. We shop for gifts and try to ignore the reality of our bank balance. We get emotionally “triggered” by intense family money issues, but try to put on a “happy face” for Holiday gatherings. We stick our heads firmly in the sand and promise ourselves: next year, we’ll do better. Does any of this sound familiar? And: do you notice similar feelings about money, every year during the Holiday season? Chances are, you’re coming face-to-face with your Holiday Money Story. Meanwhile: who turned up the volume on my Money Story?? First: What’s a “Money Story”? In my work as a Financial Therapist, I often refer to “money stories.” Simply put, your money story is the entirety of your relationship with money. It’s unique to you, and includes the whole shebang: the historical facts of your financial life, your beliefs and behaviors around money, inherited patterns from your family, and all the sensations and emotions that get stirred up in this terrain. Your holiday money story is a small slice of this larger money story. It revolves around the finances of the holiday season, which is typically full of relatives, gifts, and family traditions. All that good stuff! And all that painful stuff, too. Often, the money stories that arise for us during the Holidays are identical to the issues that we carry around with us the entire year. But for many people, the Holidays bring them to the surface in a particularly poignant, pointed way. Are any of these part of YOUR Holiday money story? Stressing out over how much money you must or “should” spend on gifts. Feeling shame that you don’t have enough money to give many meaningful, great gifts. “Going unconscious” around your spending by not monitoring your account balances when you’re shopping. Refusing to create a budget for Holiday gifts — or not staying mindful of your spending as you create and check off your gift list. Going along with your family’s patterns of activities, spending, or money stories — even though they might not work for you anymore. Feeling afraid, anxious, ashamed, or angry about broaching money conversations with friends and family members. The Holidays can feel like a wild financial ride. Thoughts, emotions, and patterns around money can be more intense and challenging now than at any other time of the year. But here’s the silver lining: because your money issues are so raw, so right on the surface, the Holidays can be the perfect time to bring some healing awareness to your money relationship. Plus, if you shift your Holiday money story, you’re setting the groundwork for a healthier, happier relationship to money for the coming year … and beyond. Ready for a New Holiday Money Story? Got a Holiday money story you’d love to shift? Ready to feel some more control and ease this Holiday season? Here’s why this is so important: our spending habits are often driven by unconscious emotional and behavioral patterns. Bringing these out of the shadows and into the light is the first, fundamental step in gaining some clarity and control. The simple process of pausing, noticing, and allowing your present-moment experience is what I call a “body check-in.” It’s an elegant, powerful tool you can use in any moment to bring more awareness to your money story. You could even give it a go right now, as you’re reading this. Pause for a moment. Notice the experience you’re having as you read. Get curious. What’s happening within you right now? What body sensations, emotions, thoughts, or memories are arising? Maybe you’re feeling excitement and anticipation. Maybe there’s a tightening in your chest: stress, anxiety, or even dread. Perhaps there’s guilt sadness or anger. Maybe your emotions are quiet, but you see a vivid slideshow of past holiday gatherings in your mind’s eye. Memories of the magic and anticipation on the night before Christmas. That year when you had no money for gifts, so you made them by hand. Confusion about why people in religious traditions other than your own spend so much money on gifts during the Holidays, when that wasn’t a big part of your childhood. These emotions, thoughts, and memories are great clues that can begin to shed light on your own unique Holiday money story. Just be with them for a moment — without needing to change them. This awareness and understanding begins to open up space for new choices. And the more intimate you become with your money story, the more access you have to the clarity, energy, and motivation needed to shift it. Body check-ins are a wonderful, simple way to begin transforming your relationship with money, so it becomes more conscious, mature, supportive, satisfying, and–yes!–even fun. And remember: you can do them anywhere, any time. As you make a Holiday gift list. In the checkout line. Around the dinner table. When things are feeling joyful and wonderful — and especially when things are feeling challenging! Now you have a powerful tool — The Body Check-In — to navigate the inner aspects of your Holiday money story. (High five!) This isn’t the whole story, though. The inner world is where things begin — but it’s not where they end. When it comes to money, our inner worlds (emotions, thoughts, beliefs — often unconscious) drive our external reality: buying, spending, earning, saving. And during the Holidays, this often means gifts: physical, digital, experiences, handmade, expensive, thoughtful — the whole spectrum. So how do you navigate this outer realm with more clarity and confidence? Keeping in touch with your numbers is hugely important here. Just like bringing awareness to your inner emotions and thoughts is the first step in shifting your inner money relationship, being mindful of your numbers (actually looking at them) is the first step in shifting your outer money relationship. For this, you’ll likely want to find yourself good bookkeeping software. Your bookkeeping software is a highly personal choice, and there are great tools out there for you. It could be Quicken, Quickbooks, Mint, iBank, YNAB or the new breed of mobile banking apps like Moven. Using smart financial software tools like this helps integrate the outer world of spending money with the inner world where our emotions and thoughts — and fresh goals — around money happen. Remember: awareness is yours to claim. It’s easy to get swept up in the spirit of the Holidays. The excitement and the stress … the gifts and the seeming obligations. If you notice feelings of swept-up-ness, head-in-the-sand-ness, or out-of-control-ness creeping into your money relationship, over the next few weeks, take a moment for self-care. Take a breath. Bring gentle, loving attention to however you feel, right now. And remind yourself: you have some new tools and perspectives this year. We’ve given you a few gentle nudges in the right direction, and there are so many other simple, powerful practices available to you. 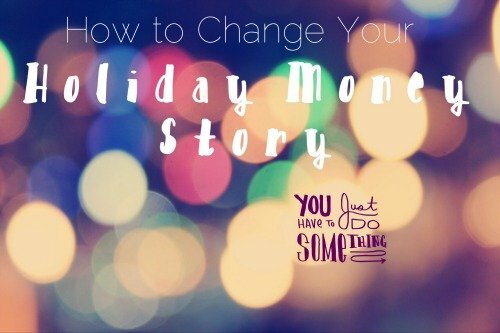 What will you choose to do this Holiday season to create deep, positive change in your money story? Reflect on how your family members relate to money … or ask them, yourself! Grab your journal and write a “Holiday Love Note” to yourself. Even if you implement just one or two of these suggestions, you’ll be gifting yourself phenomenal power to create real change in your Holiday money story — and your entire relationship to money, all year long. Your precious life, money legacies + it’s my birthday.